Info "Use your shield to block boomerangs." Zelda 2 is one of the 18-Volt's microgame sets in WarioWare: D.I.Y. Showcase. It's based on the Nintendo Entertainment System game Zelda II: The Adventure of Link. In a cave, there is Link and a Goriya. 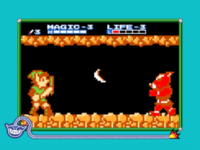 This Goriya will throw some boomerangs, which the player must block with Link's shield, by pressing on the . If Link is protected from all the boomerangs, the game is won. This page was last edited on October 8, 2018, at 22:47.